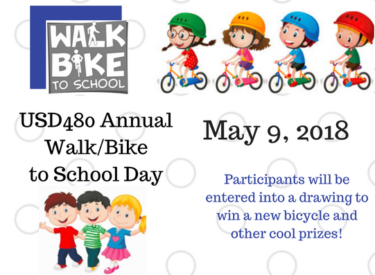 Join USD 480 students and staff on Wednesday, May 9th for Bike/Walk to School Day. Each school has special events, activities, and lots of prizes for students throughout the day for those that participate. Drivers are asked to please be aware before and after school as we are anticipating quite a large number of students to participate around the community. The Liberal Police Department will be providing additional patrol before and after school to assist with traffic control. USD 480 would like to thank the following sponsors for their support: KSCB News, Pizza Hut, Versus Signs, Keating Tractor, Billy’s, United Way, SCCC Wellness Center, and the City of Liberal.